New Piggyback wall mounted shelf kits from Eagle provide an easy, effortless way to tailor wall storage to unique environments. New Piggyback wall mounted shelf kits from Eagle. New Piggyback wall mounted shelf kits from Eagle provide an easy, effortless way to tailor wall storage to unique environments. 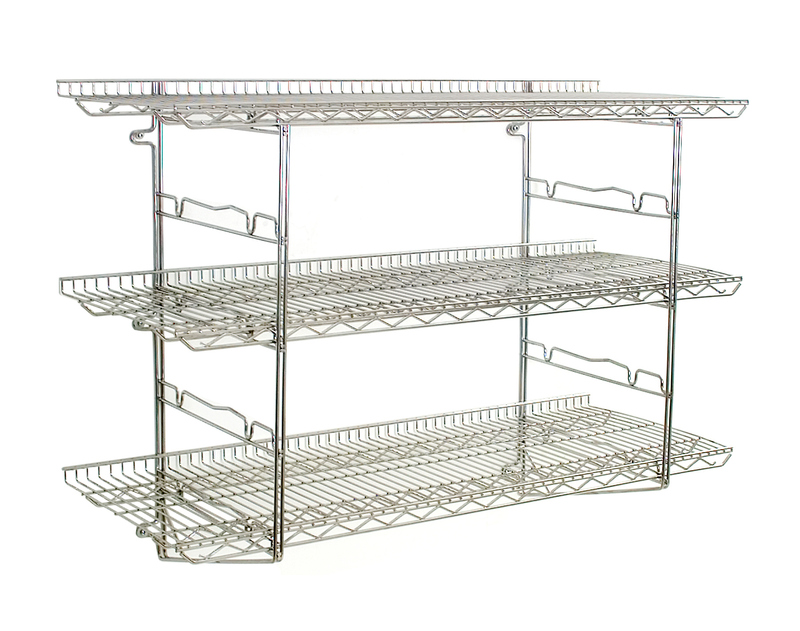 Eagle's patent-pending design incorporates heavy-duty QuadTruss® wire shelving with a bracket design that allows for the freedom to position shelving anywhere on the brackets - left or right - without the need for fasteners or tools. Simply mount the brackets and position shelf where desired. Eagle's innovative design secures the shelf in place…no additional wall backing required. 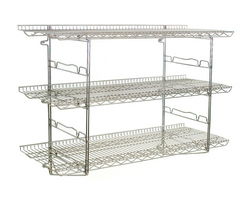 Eagle's Piggyback wall mounted shelving kits come in three or five tier configurations. The shelves are manufactured utilizing Eagle's patented QuadTruss® design which provides 25% greater strength and are of an open-wire construction, which allows for maximum air circulation. Kit shelves are 18 inches wide and available in a variety of lengths ranging from 24 inches to 60 inches. For more details on the new Piggyback wall mounted shelving kits, contact Lynda Donavan (ext. 3027) with sales inquiries, or Eagle's Marketing Department (ext. 3129) with inquiries pertaining to marketing support. Tel. (800) 441-8440 or (302) 653-3000. Web: http://www.eaglegrp.com/. Founded in 1947, Eagle Group is America's largest broadline manufacturer of commercial foodservice equipment. Over the years, Eagle has continually added to their line of products, providing the industry's largest offering available from a single manufacturer. All Eagle equipment is manufactured in the U.S.A. under their exclusive 10-point Quality System, ensuring that you receive superior-quality products every time. Our headquarters facility in Delaware - a full 14 acres under one roof - represents the state of the art in streamlined production, including the very latest CAD design capabilities and automated manufacturing techniques to ensure that you receive consistently superior quality products each time, every time. Eagle Group Logo New Piggyback wall mounted shelf kits from Eagle.